The first obvious thing about this self-published book is that it is beautifully presented, not just as a hardback but with a jacket cover; the quality of the paper and the book design are impeccable. On the fly pages, too, is something I loved as a child – a map of Huffleton and Mulberry Tree Farm which feature in the story. This is the second story in the Herbert Peabody series, the first being Herbert Peabody and His Extraordinary Vegetable Patch. The author, a small-time farmer with an extensive marketing background in food companies, decided to create the series when she observed that children do not always understand where their food comes from. 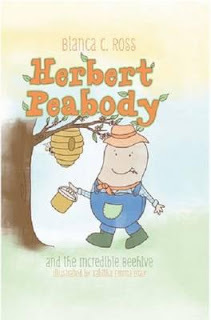 The book’s main character, Herbert, is a fruit and veggie farmer from Mulberry Tree Farm. In his veggie patch Herbie discovers Bee who is in search of a place to build her hive. He grants her permission to check out his farm and then drives off to meet up with his nieces and nephew Henrietta, Clementine and Digby at the footie. While chasing an errant ball, Herbie comes across the haunted Huffelton House where The Voice That Belongs to Nobody – a mean creature – lives. There is a mystery associated with the house and Herbie is determined to resolve it. When he discovers that his new neighbour, Bee, is having trouble finding enough pollen to supply her family’s hive, he also decides to lend a hand to find her more flowers. Author Ross writes clearly and succinctly and children aged 7 to 9 years will doubtless enjoy her simple story-telling -- provided they are able to accept talking insects such as Worm, Ladybird and Bee. The book has a number of illustrations, some in black and white line, some in muted colour; they are all, like the narrative, simple and charming. In the book’s Afterword, Ross tells of her concern about the crisis with bees; their populations are decreasing, and of course, without bees, food production as we know it will cease. The author deserves full credit for drawing the readers’ attention to this situation.